Are you blah’ed out by beiges and not-so-nutty about neutrals? Well, don’t be! There are some fan-tan-stic tans out there that not only act as backdrops to the features of your home but also help to neutralize or camouflage unwanted elements. Grant Beige sits nicely in the beige/tan range without being too light or too dark. Grant Beige is pretty darned ‘tan’, in that it doesn’t have that typical golden beige look and in fact, in a north facing room, it can even lean slightly grayish. In the above photo, you can see how natural light can make it appear lighter and brighter, while below, it has a slightly deeper look on a more shadowed wall. Bennington Gray has more depth than a typical beige/tan colour. It can pick up a slightly warmer look than Grant Beige, without being too golden/yellow toned. Manchester Tan is one of the lighter, but not washed-out beige/tan colours available. Manchester Tan has some flexibility to humour those who prefer a more neutral tan and those who like the warmer end – it all depends on your exposure! This shows Manchester Tan lightened by 25% in a space with different types of natural light. Stone House is one of the warmer ones on this page. 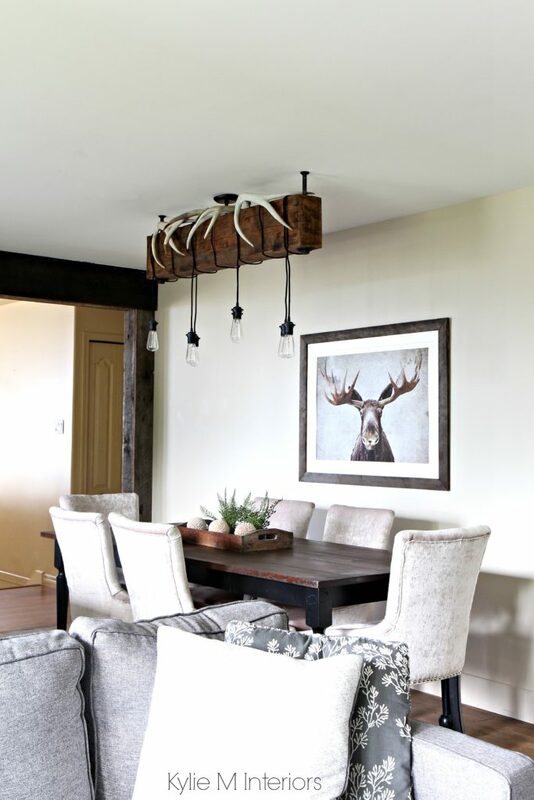 While it is a beige paint colour and will sit quite neutral on the walls, it has an awesome blend of warm undertones, without committing to any particular one. It has a bit more of a dense, slightly heavier feeling than the above colours. CLICK on the above image to see affordable and fun package options! Lenox Tan is a beige paint colour with a slight orange undertone and is undoubtedly the warmest colour on this page. If you aren’t a fan of orange undertones you’ll want to stay away from this one, however, if you want a slightly warm neutral without a strong yellow – then this could be your colour! Shaker Beige is a gorgeous warm beige that is similar to Lenox Tan but has its own vibe. Its undertones do focus a bit more on orange, rather than yellow or red, so if you aren’t an orange undertone fan, this might not be the colour for you! However, it IS well-balanced and can humour the other undertones, particularly red/pink. Still not sure which is the best colour for you? I have cherry cabinets and furniture all over my house. It’s been very difficult tochoose a color for my north facing 2 story family room. Someone suggested Roasted Sesame seed from BM but I think it may be to bright and yellow. Any suggestion? Hi Mary, you are sooo right in thinking that Roasted Sesame seed is too bright and yellow. While the warmth would be nice in a north facing room, it can get a bit ‘colourful’ when put with cherry cabinets! Here’s a few thoughts for you…. 1. Acorn Yellow – warm and rich but well grounded. You just might find it a touch ‘heavy’, so keep in mind that you can always have it lightened by 1/4 to take the edge off of it! 2. Cable Knit – along the same lines as Roasted Sesame Seed but considerably lighter. This colour varies in undertone throughout the day which is nice as it flexes from an orange to a yellow undertone. It’s also very versatile as it looks great with a lot of other colours. 3. Sandy Brown – definitely the most neutral of the bunch, which makes it pretty versatile, but if you’re looking for something with ‘some’ colour you may find it a bit flat – depends on your tastes! Hi, I love your website & have been reading & rereading your posts. I’m stuck on what color to paint my foyer. We just painted the joining living room Thunder (Ben.m). The kitchen is a green color. We have a fireplace with orangy/yellow brick in this area too. I cannot make up my mind! Should I use a beige neutral color, something like templeton, Chelsea gray? So stuck!!! Our house is a multi level, so the foyer is one level & the kitchen/ living room are up a few steps. Thanks for any ideas! Thank you Kelly, I love to hear that!!!! Okay, so you have to be careful with the orangey/yellowy bricks that you don’t go too tan/gray/neutral around it or else you risk it just not ‘visually connecting’ with your fireplace. I also LOVE Templeton but it could be too blue – really depends on your home and it’s accents. I love Chelsea Gray and as long as your entryway isn’t a dungeon it can be amazing! You can also consider having it lightened by 1/4 to take the edge off. You’ll find that it should tie in really nicely with your grout and won’t clash at all with your other colours as it really is quite a lovely neutral. I hope that helps you Kelly!! Hi Kylie, you have a wonderful website! I am having a difficult time picking the BM color for my basement , We have medium light gray wood-like tiles with a little green in it. It is a big open space with some (but not a lot) natural light . I am looking for some neutral cosy color ( I do not like green on the walls) and also we need to put a kitchen and 7 wood doors there . I am not sure what color of the wood to pick. I am assuming that kitchen and doors do not have to be the same color. I am going to Really appreciate your respond! Hi Irena, you have a tricky one. ‘Generally’ as soon as you put green with warm colours (yellow/orange) it can look outdated, so you have to be sooo careful. Neutral and Cozy, hmmm, I’m thinking. Okay, so my best advice to you is to stick with neutral. While it won’t be ‘warm’ you can add rich and deep colours to the space through furniture/toss cushions/drapes/etc…that will help to make things feel cozy – does that make sense? 3. If you liked green on the walls, then I would show you Sandy Hook Gray (which is truly and amazing colour) It’s basically a gray with a slight green undertone and it’s so restful and beautiful. However, if you truly don’t want green on your walls then you’ll want to avoid it! I would LOVE to send you more colours, but sometimes your room dictates where you can go. With staying away from the greens and the ‘warm’ colours (like I said, they can look funky in a bad way with your grays/greens), I think these might be a great place for you to start! Let me know what you think, I don’t want to leave you hanging if none of those work for you! Hi again! I wrote before asking for recommendations on a color for our foyer. I took forever to decide and finally chose Copley Gray. It looks soooo green. Ugh. Do you think there is a color we could have added to the rest of the gallon to make it more gray or brown and then just paint another layer? We have more than half of the gallon left. Our kitchen is currently a green color and I want to get rid of that too!!! Or…maybe I won’t mind the Copley (green tone) if we paint the kitchen a color other than green. The cupboards, floor, trim are all looking so orange. Hi Kylie! Your website is fantastic, thanks for all the great advice! 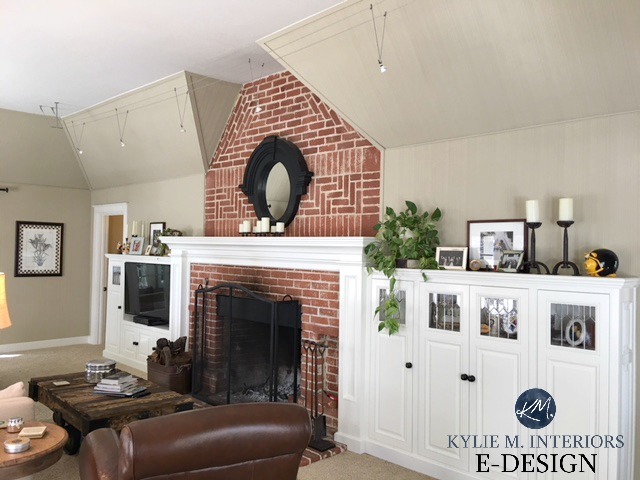 Love the photos, especially the living room with the huge modern stone fireplace, wood floors, and BM gentle cream walls….my ideal living space! I’m looking to paint a small portion of a staircase (i.e. essentially the landing at the top of the basement stairs, which is also the entrance from our garage). It’s a tiny tiny little spot, about the size of a long powder room and is currently just a bright white. Our basement leading up the stairs is BM Sandy Brown and our mainfloor is a mixture of warm beiges and white. The carpet on the stairs is a light beige berber and our tiles on the landing are a cream colour. I’m stumped on what paint colour to choose. To be honest, I originally LOVED the sandy brown because the previous owner had all cool blues down there, including the carpet. So I went with sandy brown walls, cloud white trim, chocolate brown and tan sofas, and beige carpet. But now it’s starting to feel too brown/gold so I’m not wanting to enhance yellow or gold tones in the landing. I think it would be nice to do a bold accent colour like chocolate fondue or carolina gull. Any idea how those colours would look versus sandy brown? I also love edgecomb gray and in general would like to take our home into more grays tones as time goes on (except it would have to pair well with yellow-beige undertones as our existing Permanent features are those colours). Any suggestions? Hi Jen, sorry for the delayed reply! These days I try to refer questions to my Online Consulting as I’m so busy with my biz, but sometimes I simply ‘like’ a question and want to answer it because…well, because I want to – so here we go!!! Okay, so I love that you want to go brave with your colour choice. Sometimes when you have a lot of warm neutrals in a space it’s nice to add some Balance – meaning a cool colour. Carolina Gull is a great way to do that. Some of the earth toned green/blues can go too gray in a lowlight space or in the evening, however Carolina Gull retains it’s ‘colour’ – which means it’s awesome! I had it in my stairwell for a while and loooved it, but as usual, I got bored! Edgecomb Gray is a great colour but PLLLLLEEEEEEASE don’t put it with you current palette. It’s a gray, but it just barely slightly leans towards the soft end of things, meaning pink. Now I don’t mean it will look at all pink, but compared to some of the more neutral grays (like Gray Owl and Revere Pewter) it just leans that way. And it will lean that way if it’s paired with warm/yellow undertone colours as the undertone will clash for sure! If you would like to add more grays to your palette, while keeping colours like Sandy Brown, you’ll want them to be dark enough that they aren’t typical ‘light grays’ – like Edgecomb, as they can just look dirty. You might want to lean into grays that have a wee bit of undertone (which means that they will shift colour throughout the day which is a cool thing). If you took colours like Gray Horse and Sea Haze and had them darkened by 1/4, they would be nice partners with Sandy Brown and definitely lean towards the gray end of things. And Sandy Hook Gray…oh my goodness, Sandy Hook Gray is amazing and would look soooooo good with Sandy Brown. It’s kind of like a gray with a brown/green undertone….I love it…. Okay, so I hope that helps you out!!! Hi Kylie, I just realized that I never said thank you! so, belatedly, thank you very much! in the end we went with Carolina gull for the landing. then we went on to repaint a lot of the beige walls on our main floor revere pewter! looks fantastic. You are more than welcome Jen, I’m glad it worked out – I do loooove Revere Pewter!!! Great post! I’m wondering what you think about SHAKER BEIGE? There is so much info online about Shaker Beige being the go to neutral. Since I didn’t see it on your site, I wondered what your opinion is. Hello, we have a multi coloured pink brick home and need a beige colour to paint the garage doors which stick out front, and the shutters. Front door is a pewter type colour. Right now everything is a horrible dark brown, including soffits. What colour beige from Benjamin Moore would you suggest? Hello we are planning on professional spraying painting our kicthen cabinets, replacing our countertop we absolutely love the kitchen above with the decorative words live and laugh. Could you please confirm the cabinet, wall colours. is the trim painted white around the window and what is the countertop made of and what is the colour. We would love to replicate this exact kicthen. Hi Susan, we’ve chatted via email and I hope your creating the kitchen of your dreams! I have just found your website .I really appreciated your work here. Actually I am stuck .I had done(painted) my hall way and living room with invigorating green color from Behr. could you suggest me color for kitchen which has medium brown cabinet and beige brown cabinet and family room which is beside the kitchen as my house has open kitchen concept. I’ve studied countless sites, have learned so much from you, but I’m stuck. Upstairs has dark brown walnut floors…downstairs has cherry wood. Downstairs living room has grand reddish-grey brick fireplace. House is a white and black colonial type. Lots of light downstairs. Big windows. Darker hall upstairs. I want a light neutral hallway paint with either greige or creamy undertones. I’m torn. Upstairs I want greige undertones in my light paint and downstairs I want creamy warm undertones. Problem- downstairs to upstairs is continuous…staircase, tall ceilings at entrance. I’m so stuck. What works for one floors doesn’t work for the other. Is there any hope for a good paint colour? I’ve agonized for months. Paint samples, 100s of paint cards all over the house, detailed study of undertones….still stuck. Is white my only option? Hi Shawna, you absolutely aren’t limited to white at all! I used to answer a lot of questions online but I get pretty inundated with questions. I do have affordable online consulting where you can actually send me photos of your space/rooms so that I can give you some pretty precise colour ideas. If you are interested your consult would be $60 and I would give you 2-3 colour options with full explanations (so you can understand why one colour works and another doesn’t.) Hope to hear from you! I saw a picture of some of your work on Pinterest. It was an entry way with dark furniture and cream color walls. There was an oversized metal clock with numbers (rather than Roman numerals) placed on the wall. Can you tell me where I might purchase the clock? Hi Helen, that beauty is from Urban Barn! If you are local (Nanaimo) I can get you 15% off. Regular price was $169 I think. My living room is painted gray owl, which I love! What would be a good color to paint the adjacent dining room that will look good next to it? I want to stay neutral but not have another gray that is too alike. I was thinking copling gray. Any suggestions? I’ve really enjoyed looking over your site, very helpful. I’m needing help with paint color. I have stone lion in my living room by Sherwin Williams ( that i feel is too dark for the space). The only natural light I have in the living room is coming from the back of my house which is south facing, as the front of the house is north facing. In my foyer (north facing) I have 50% stone lion ( not much nat. light there either). My living room connects to my dining area that is connected to my kitchen, so pretty much open floor plan. In my dining area I have believable buff, which looks like a soft yellow. I really love it BUT im willing to change it as I want to paint the living room and foyer a lighter color and want it to flow into the dining and kitchen, all one color. I feel the different colors I currently have are too busy on the eye. My color pallet that Im leaning toward is the creams/tans/brown earth tone colors. I love the living room photos that i see on the internet with the cream on creams in various shades. I have bright white trim and wainscoting throughout. The problem I’m having is mainly with my kitchen cabinets. I want a color that will work throughout PLUS compliment my kitchen cabinets. My cabinets are base cream/ distressed/ glazed. With the glazed cabinets im having a hard time finding a color to compliment instead of clashing. My back splash is crema marfil with a medallion of brown/tans/creams. My granite is a Giallo ( I cant recall the exact color, maybe the Verona). I have looked at Accessible beige ( pretty but i feel its too dark in certain light), Ive considered edgecomb gray but looks a little too gray at times. I think the colors look better in homes with taller ceilings and more nat. lighting. If you can sheare some ideas, Id greatly appreciate it. I have tried soooo many samples and they either have too much yellow, too much pink or too much gray undetones. Kylie, love love your blog! First time commenter, long time reader. I wanted to paint my house (we just moved) Gray Owl, the kitchen cabinets are wood (kind of sand colour) the tiles around the cabinets are also a sand type colour with some yellow-ish tones. Not a colour I would have picked but it’s not in the budget to replace it right now. Any recommendations? Is Gray Owl a no-no? Thank you! I’ve been reading you blogs for months and they are super helpful! I painted most of my house BM Revere Pewter thanks to your advice! Just a quick question – will Benjamin Moore Grant Beige work as an accent wall with BM Edgecomb Gray? I think they are both in the greige family with a greenish undertone, right? Hi Kylie, thanks so much for responding. I should have explained my dilemma further. I’m looking for a neutral warmish beige colour to paint our north-facing living room. We have mid-tone reddish hardwood floor and a light gray/beigish stone fireplace. We have a chocolate brown couch. I want a slightly darker colour to accent the fireplace wall. Also we have Revere Pewter in the adjoining hallway so I didn’t want anything that would clash with that. Hoping you can suggest 2 colours for me! Thanks again! Ugh! I just got done painting my family room in SW Accessible Beige (based upon your description of the color and its undertones) and I am seeing a light celery green – not the look I was going for at all! The room has an east facing patio door, a west facing window, golden oak wood trim and “Chicago old” brick fireplace that dominates the room. I’m ready to try a different neutral.Any suggestions? Home Depot mixed the color for me in PPG eggshell, would that account for the green that I am seeing? Ahhhh yes, colour matching CAN work, but not always. I had THE EXACT same thing happen to another client! You can also get some green if you have a lot of grass/trees reflecting in from outside. I just purchased a pewter leather sofa with a tan accent chair and I was wondering what colour would look best in my living room facing South? I have glass tables with brass accents as well as lights. Oh Ya also oak trim unfortunately. I was swinging toward grant beige as I like paint with Lrv around 50. If you have a better suggestion I would love to hear.